For the "dirt" base cookies, I used a square cutter and Lilaloa's scrumptious, "The End-all for Chocolate Cookies Recipe". I used Hershey's Special Dark Cocoa to make them dark, "soil" brown. The bottom cookie is solid, but the top two have holes cut from the middle, done immediately after they were taken from the oven, while the cookies were still soft. This way the holes remained even, with sharp edges. The cookie layers were "glued" together using Sugarbelle's chocolate royal icing, which is oh, so tasty! The "dirt" (leftover) brownie crumbs were adhered to the top of each cookie stack with the royal icing too. 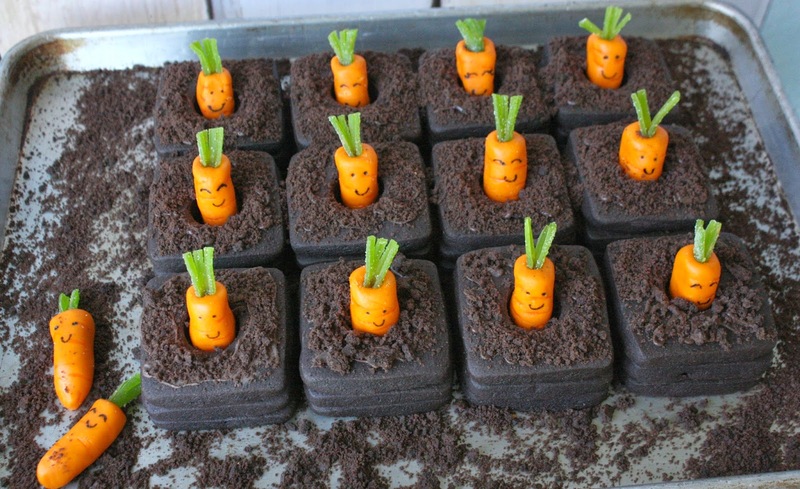 I knew I wanted to make some smiley carrots to place in the soil, and thought that fondant would be the perfect medium. The Decorated Cookie's Marshmallow fondant worked beautifully! Homemade marshmallow fondant is easy to make, and I used almond extract for the flavoring. YUM! 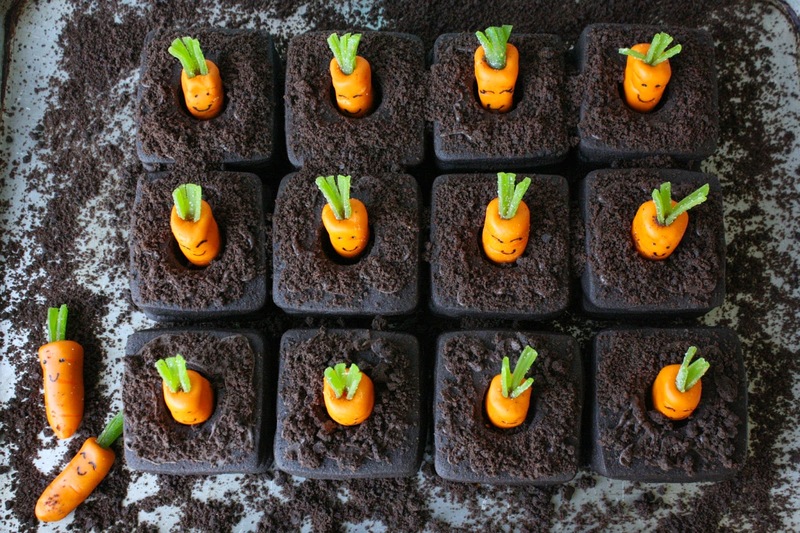 Each carrot is topped off with a Sour Punch Bites (apple), snipped with scissors to resemble carrot greens. The carrot patch is ready to be harvested. It would be fun to serve the patch on a platter and have each guest take a stack, or wrap each individually (above) and give them out as gifts/favors. They are very chocolatey and oh, so good! Perfect with a glass of milk. 3. Roll dough out about 3/8-inch thick on a lightly floured surface. 4. Immediately after taking from the oven, use a small round cutter to cut the center from 2/3 of the cookies, leaving the other third, solid. 6. To stack-place the solid cookie on the bottom, apply some chocolate royal icing to the perimeter and center the second cookie (with a hole) on top. Do the same for the remaining top cookie. 7. Apply chocolate royal icing to the surface of the top cookie and sprinkle liberally with the ground up chocolate crumbs. 1. Add orange food coloring to the fondant and blend in well. 2. (For each carrot)- take a small amount of fondant and roll into a 1-1 1/2 inch ball. 3. Roll the ball between your hands to taper it into a carrot shape(make sure it is a size that will fit into the cookie holes). 4. Use the orange marker to apply horizontal lines to resemble an actual carrot. 5. Use the black marker to apply a face. 6. Cut an apple Sour Punch Bite in half (vertically) and then snip four slits into it with kitchen scissors(without cutting all the way to the bottom, so that it remains in one piece). 7. 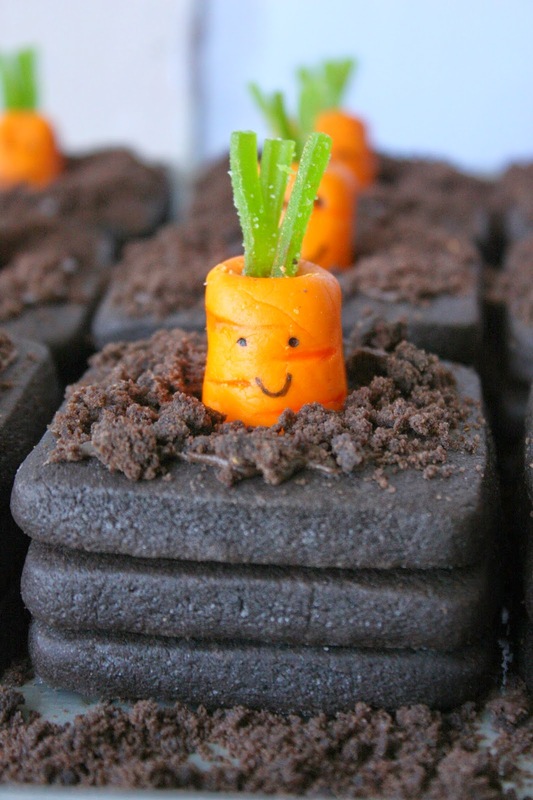 Make a hole in the top of the carrot, big enough to slide in the greens. 8. Push green stem gently, but firmly, into the top of the carrot. 9. If the greens are too tall, snip some off the top. 10. 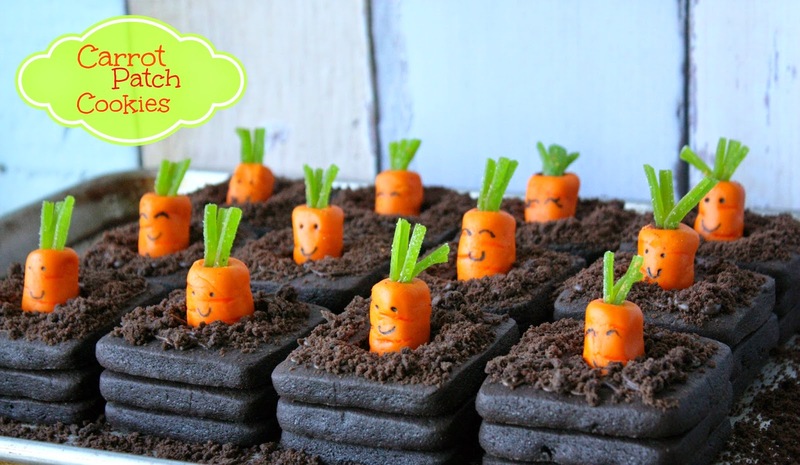 Place each carrot into the center of a cookie stack. Oh my WORD! That means: "wow, I love these." These cookie masterpieces are so cute, I can barely take it! Lots of steps, but all really easy. And that carrot, forget-about-it! Sooooo adorable! o my...these look just like real things! You are a genius, Sue. These are so cute Sue!! So super CUTE!! I love these. Pinning now! I love these! 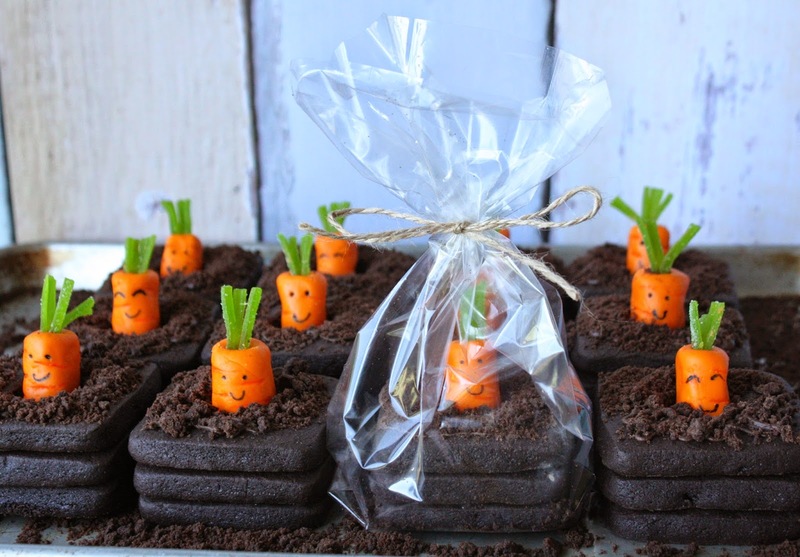 I've seen a lot of adorable garden/dirt cookies and treats, and yours is a favorite for sure! Gah! Love the carrots. Just so adorable! Awe I love their little carrot faces. If you have other kid-friendly crafts, we'd love it if you would submit them. If you would like to display a featured button on your site, you can grab one from the right side bar of your post above. Thanks for a fantastic idea! 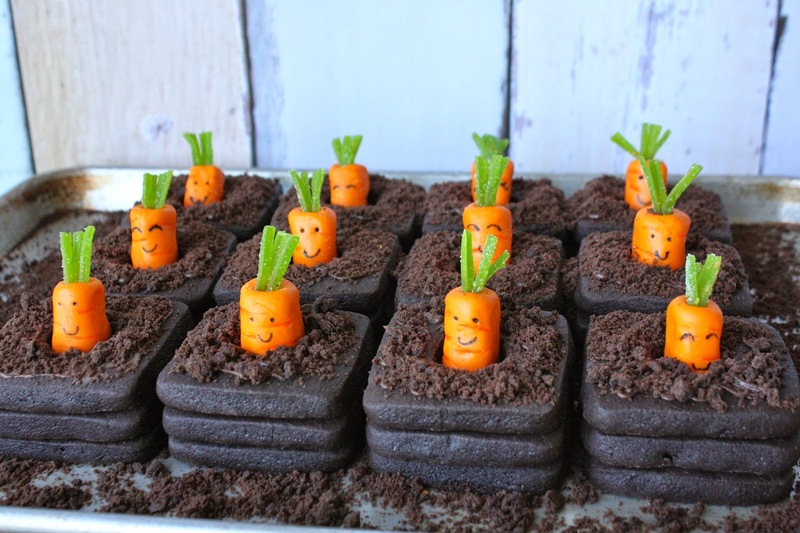 What a creative Easter treat idea! These are just too cute for words. Happy Easter to you and all your little munchkins! These are so cute. What a fun, 3D cookie!